The deferred, second phase of Brigham Gibbs’ golf career has turned into a success story. Having basically given up the game for about a dozen years while concentrating on work, the former professional golfer has become a force on the Utah amateur circuit. As a long hitter, he’s one of those relatively young (54) senior golfers who’s torn between competing in the regular and senior divisions. Gibbs focused more on the UGA’s senior schedule in 2018. That pretty much explains how he became the Senior Player of the Year. And he performed very well in competition this year, starting with the UGA Winterchamps. He made seven birdies in the final round at Sky Mountain Golf Course, rallying to beat Kurt Jamison by one point. Gibbs defeated Brett Sampson 1 up in the final match of the UGA Senior Amateur at Glenwild Golf Club, coming through in five matches that all went to the 17th hole or beyond. Gibbs wishes both he and Sampson could have played their best golf in that match, but he was happy to win and appreciated the opportunity to play Glenwild. He enjoyed a much more dominant performance in the Utah Four-Ball Championship at Park Meadows Country Club, as he and partner Jon Wright never had to play more than 15 holes in any match. They took advantage of their length off the tee and teamed well, picking each other up with timely birdies. 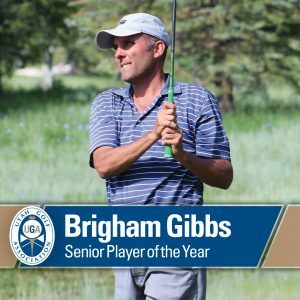 Gibbs also tied for third place in the UGA Senior Stroke Play event at Glen Eagle Golf Course and won his division of the UGA Invitational at Jeremy Ranch, shooting 70-74 to beat Randy Hicken by one stroke.